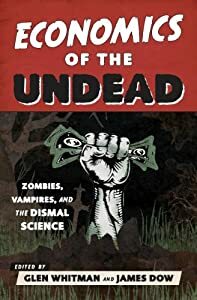 In Chapter 16 of Economics of the Undead, “Zombies as an Invasive Species,” Michael O’Hara suggests that recreational zombie hunting could help to keep the zombie population under control. As evidence, he points to the popularity of video games like Left 4 Dead and Resident Evil. And that popularity shows no signs of abating. Over the last couple of weeks, I’ve become aware of no fewer than seven recent or forthcoming zombie-related video games: Zombie Village (cartoonish zombie hunting), Zombie Puzzle Panic (Candy Crush with zombies), Coffin Dodgers (car racing with zombies), Escape Dead Island (mystery on a zombie-infested island), Deadskins (zombie Indians, the most politically incorrect of the bunch), Undead vs. Plants (zombie vegetation? I don’t know), and Zombie Driver (car chase-and-rescue with zombies). But could it be that real zombie-hunting and virtual zombie-hunting are economic substitutes? If so, then the presence of these video games could actually reduce the efficacy of recreational zombie hunting as a means of keeping the zombie population in check. Is there any evidence that people would prefer the real thing? Actually, yes. A spate of recent news stories document the rise of zombie gun ranges. Tired of firing their weapons at the same old boring targets, gun enthusiasts now imagine they are blowing away hordes of the undead. In a related development, paint-ballers and laser-tag enthusiasts have also adopted the walking dead as favored targets. Point being, people are no longer content to hunt zombies from the comfort of their couches — they want the experience to be as real as possible. I’m guessing at least some of these folks will jump at the chance to take on the genuine article. This entry was posted on Thursday, July 17th, 2014 at 11:46 am	and posted in Uncategorized. You can follow any responses to this entry through the RSS 2.0 feed. « Zombies in the Real Estate Market?